Everyone’s dream to have a lovable Predator dog on the big screen is realised. Writer-director Shane Black had a small acting role in the first Predator but didn’t write or direct it. 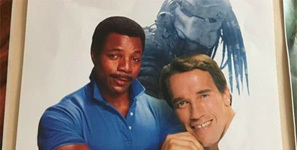 He went on to become the master of the buddy-cop actioner, from penning Lethal Weapon to helming The Nice Guys. He also lost a step directing a sequel to another established franchise, Iron Man 3. The Predator is a partially-entertaining entry that starts off well enough but falls apart the longer it goes on. As the vastly superior Predators showed, it’s better to have 1 great concept than 10 weak ones. This film is closer to Predator 2 than Predator, as it favours having the creature walking around in plain sight over mystery and fear. The makeup/fx on the Predator are solid, big money has been spent throughout, the lead isn’t bad, there are some genuinely funny moments (see waking up Munn), and it’s gripping during the breathless lab breakout and school sequences. However the problems are far more numerous, including: reliance on coincidence, muddled objectives, silly exposition leaps, heavily-used magical autistic kid, friendly Predator dog (! ), silly glib scientists, awful Predator communication ideas, gunshots only being fatal when convenient, the Predator’s swivel chair, and a final scene idea bad enough to put the franchise into dormancy for a decade. The main antagonist/hunter is not really the creature but rather a nonsensical human who wants to eliminate the looney team for witnessing the alien, even though there are dozens of other witnesses throughout. All of which… leads to one of the year’s biggest disappointments. BAH! So disappointed. Rewatched Predators the other day and it’s solid. Good catch, they’re both pretty misty.